There is no other way to have expertise in chemical tanker operations other than by working on board a chemical tanker. Chemical tanker is a complete different field. With each new cargo you are on a completely different ship. This is because the requirements both safety and otherwise changes with each cargo. It takes months and years of working on chemical tanker to get used to its uniques operations. IHS FairPlay expects chemical cargo demand forecast to surge by 2020. Radiant insight INC has said recently that chemical tanker market size will be worth $2.23 Trillion by 2020. All these forecasts and trends show that there will be huge demand for chemical tanker officers on these ships. Many shore management will be forced to shift officers from other ships to chemical tankers. But performing each task on chemical tanker without earlier experience on these can be difficult. One such task is the stowage of the cargo on chemical tankers. This guide aims to help officers with comparatively lesser experience on chemical tankers. However, this can also be used by experienced officers to help them refresh their memory. As is the case with other ships, on chemical tankers some operators will make the stowage plan and send you for verification. Others will send the cargo list for loading and would expect you to stow each cargo and send them the stowage plan. In both the case we need to check the list, trim and stability criteria for each leg of the voyage. This is no brainer as we do same on all type of ships. 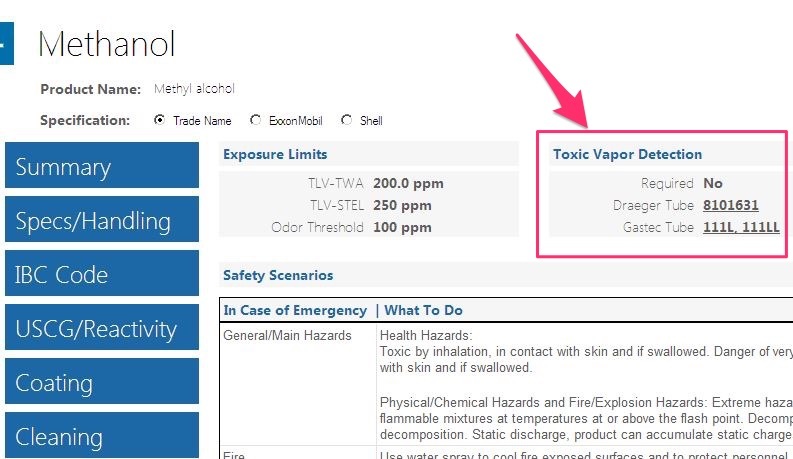 But there are few things specific to chemical tankers that we need to check while planning the stowage. 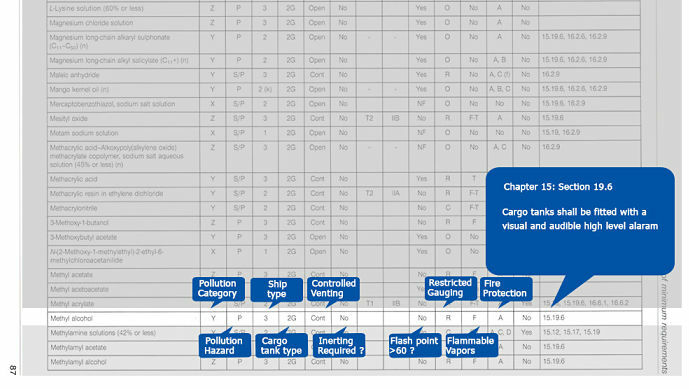 There are steps that we need to follow while preparing the stowage plan on chemical tanker. If you have been sailing on chemical tanker for some time now, these might come naturally to you. But for the first timers or first time mates, these need to be followed religiously. Can we load this cargo ? We need to know if we can load these chemicals. Let us go step by step to know if we can load these cargoes. One chemical can have many trade names. To know if we can load a cargo or not, we need to know its proper shipping name listed in IBC code. Certificate of fitness lists all the cargoes that a vessel is fit to load. The name of the cargoes in the COF are proper shipping names (IBC name) and not trade names. So if the charterer has given you trade names, you first need proper shipping name of such cargoes. 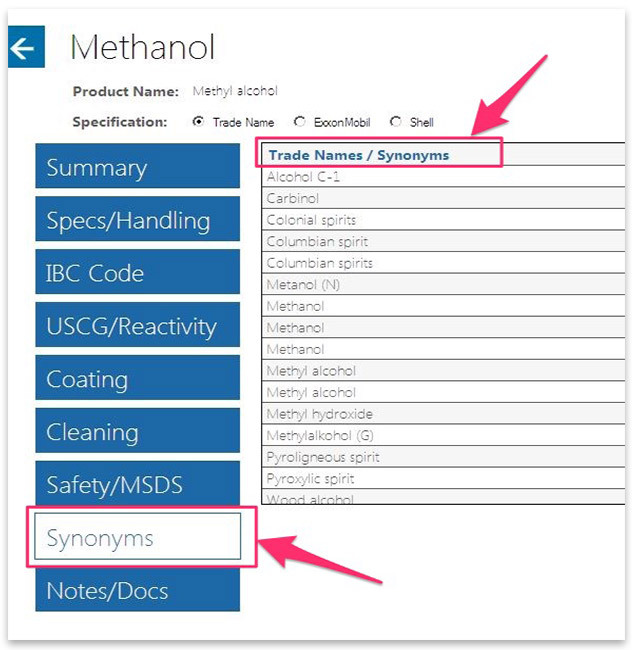 For example in the cargoes above, methanol is a trade name. 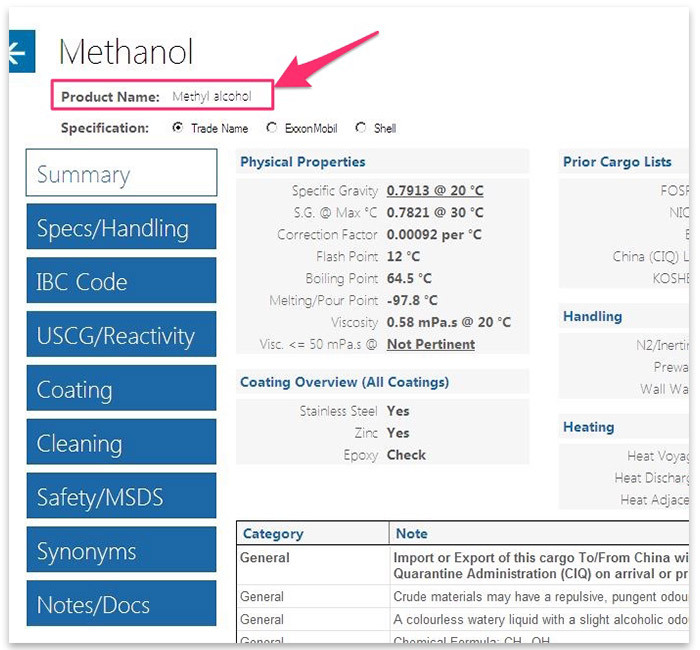 Proper shipping name of Methanol is methyl alcohol. How can we know if the name is a IBC name or trade name ? Just go to IBC code chapter 17. See if you can find that cargo. If it is there, then it is proper shipping name. If it isn’t there in chapter 17, then it is a trade name. If we just have the trade name of the cargo, how can we know its IBC name ? There are 3 ways that I can think of. First, you can go to chapter 19 of the IBC code and see if you can find your cargo name there. 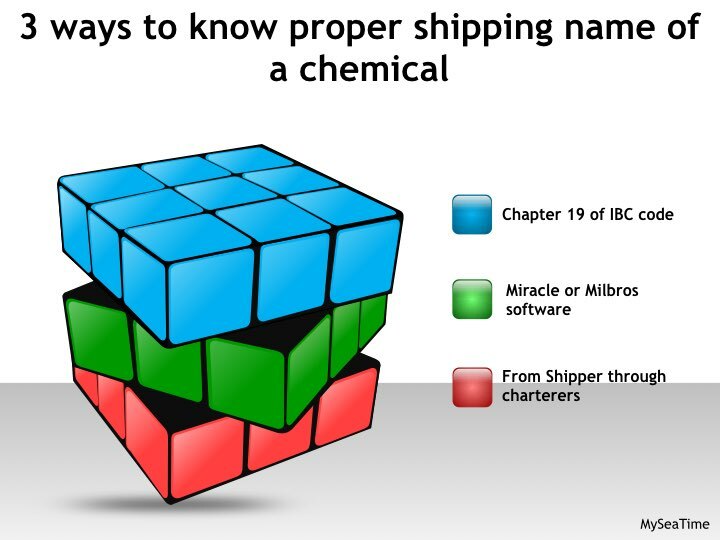 If you can, then it will give you the proper shipping name (IBC name) in the next column. Second, you can go to tank cleaning guide software such as Miracle and Milbros. This software has more or less become a necessity to have on all chemical tankers. More often than not you will find one of these software on chemical tanker. So for example, if you open milbros, go to commodities. In the search option, you can type in the name of the cargo and then choose from the list. This will give you the product name (IBC name) of the cargo you entered. In fact, if you go to the synonyms section it will give all the names this cargo is known as. Third way to know the IBC name of cargo is by just asking your operator or charterers. Knowing the proper shipping name of cargo being loaded is very important. Now that we know the proper shipping name of the cargo, go to cargo list of the COF and check if your cargo appears in the list. The cargoes in the COF are listed in alphabatical orders. Let’s check if these cargoes appear in the COF of a real ship. Acetic acid does not appear in the COF of this ship. So this ship cannot load this cargo. Methyl Alcohol appears in the list and we can load this cargo too. In the same way we can check for Toluene Diisocyanate and Palm fatty acid distillate. The certificate of fitness does not take into account the coating of the tank. Even if we are allowed to load a particular cargo, we need to check if the coating of the tank is suitable for the cargo to avoid the damage to the cargo coating. There are number of coating that the cargo tanks of a chemical tanker can have. These are the few of the most popular coatings of cargo tanks on chemical tanker. If the tanks are stainless steel coated then you do not need to worry about the coating. Now lets see the coating manual of this ship. 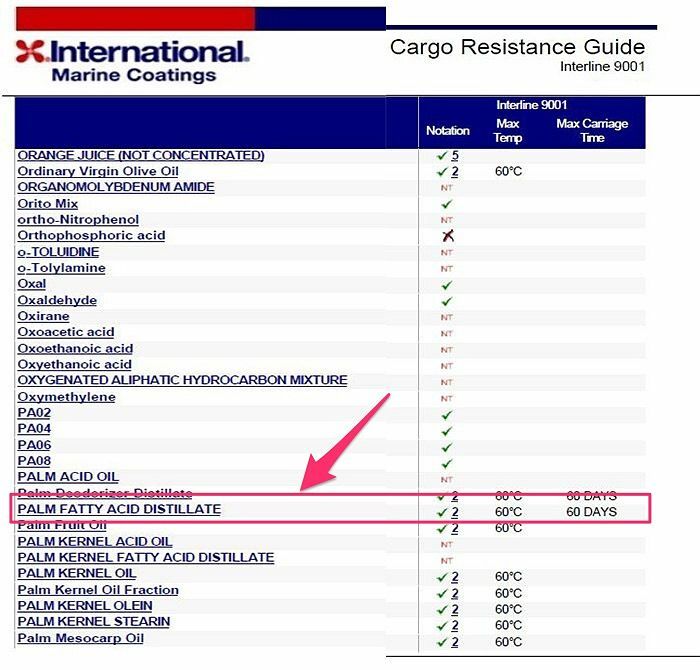 Let us look for cargo “TDI” and “Palm fatty acid Distillates” to see if the coating is resistant to this cargo. As we can see TDI can be loaded without any restrictions. 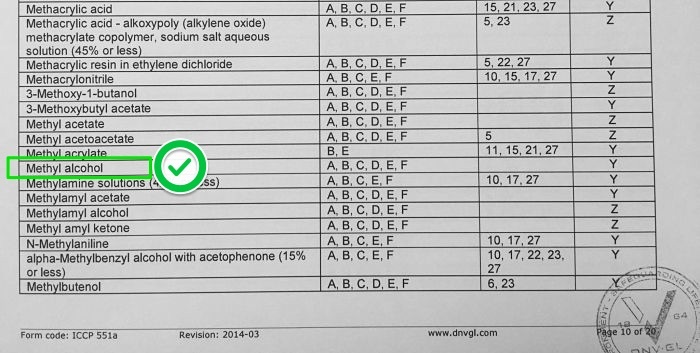 For Palm Fatty acid Distillate, you can see above that we can load this but it has a notation no 2. We need to look at the coating manual for the explanation note of this. For example for this cargo, it meant that fatty acid content of the cargo should not be more than 10%. In this case we need to inform charterers about this. Charterers will get this confirmed from the shipper. Before their written confirmation of the fatty acid content is received, you should not load this cargo. Some cargoes require heating during the voyage. Charterers instruction may include maintaining a minimum temperature during the voyage and having a minimum temperature during discharge. On chemical tankers sometimes we are required to maintain cargo temperature as high as 80 C with ambient temperature as low as -15 C.
While planning a stowage chief officer must check if the ship has the capability to heat the cargo to that extent. If the vessel is not capable of heating to that extent, this cargo should not be loaded. Even when the ship is designed to load a particular chemical, each chemical can have its own requirement. These requirements can be checked from four sources. While each of this source can have some overlapping requirements, it is important to go through each such sources. Chapter 17 of the IBC code is the best way to start with finding the special requirements for a cargo. Chapter 14 of the IBC code lists the safety equipment requirements with respect to chemicals. Another requirement as per chapter 14.3 is to have ELSA for every person onboard for the cargoes that have “yes” marked in column n of chapter 17. For toxic cargoes, it is required to have antidote for that cargoes. While planning the stowage, Chief officer need to keep in mind if these equipments are available. If not then he should inform to the company immediately. To be safe on chemical tankers, it is important to measure the presence of toxic gas in the area accessed by the crew. Each cargo can release a different toxic gas and as such need equipment to measure it. Drager and Gastec are two of such equipments that mesures toxic gas concentration. The Drager and Gastec have pump that uses tubes to measure toxic gases. Each type of toxic gas has its own tube. Before loading the cargo, chief officer must ensure that he has drager (or Gastec) tubes for the toxic vapours that require measuring. But not all cargoes are toxic and not all cargoes have the drager tubes available. To check this, again you can use Milbros or Miracle software. In the Milbros software, search for the commodity and go to Safety/MSDS section. You can find the information regarding Drager and Gastec tubes applicable for that cargo. There has been a new requirement for the PV valves on chemical tankers. 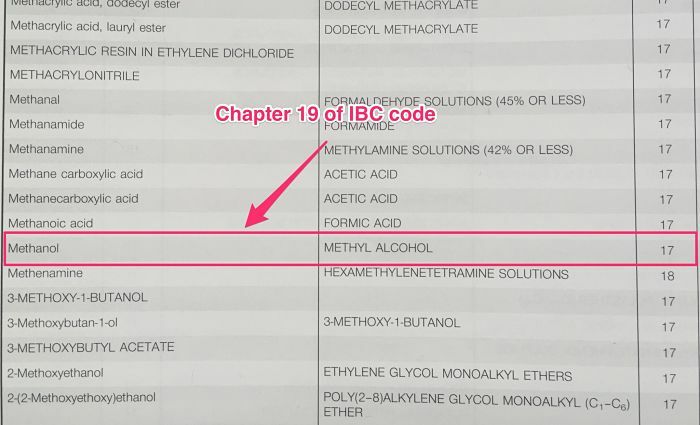 Check if in chapter 17 of IBC code, the column i” shows IIB requirement for the cargo. If yes, vessel need to have new type of PV valves which are MSC/Circ.677 IIB compliant. So you have checked and found that you can load the intended cargoes. You have also ensured that you have all the required safety equipments on board. Now the time is to make the stowage plan. There are number of things that you need to keep in mind while planning the stowage. Let us see each of it. Some chemicals react with each other. We call these incompatible chemicals. These chemicals cannot be stowed adjacent to each other. This be because of the simple reason that if there is a crack in the common bulkhead, it can lead to disastrous situation. 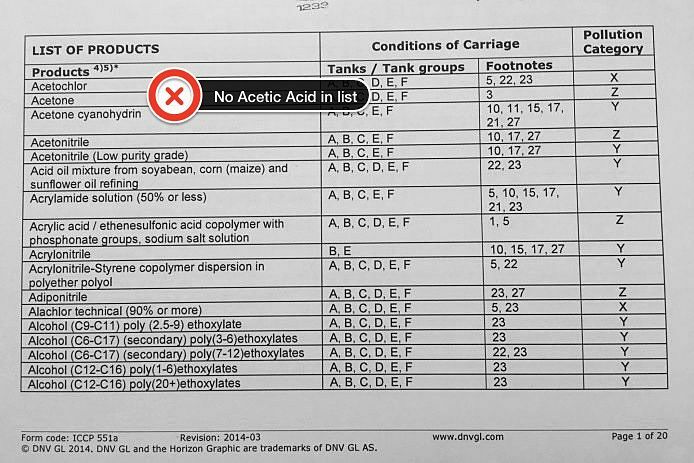 For example any acid cargo cannot be stored next to bases like Caustic soda solution. 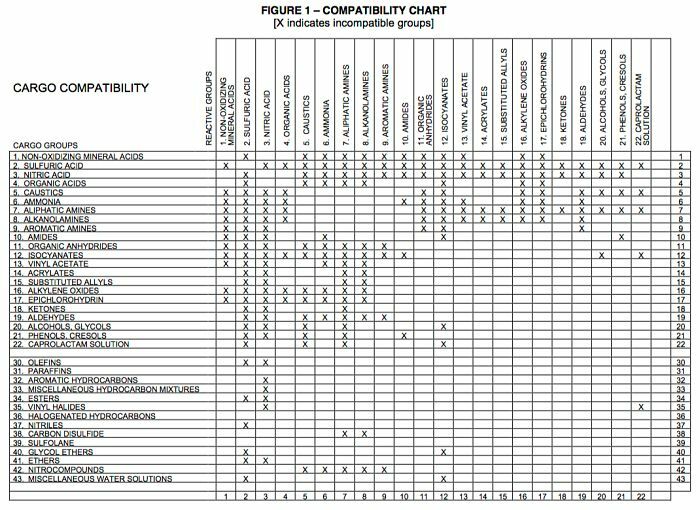 Most common method of checking if two cargoes are compatible or not is the compatibility chart from US coast gaurd. USCG has released full guidelines on compatibility of chemical cargoes which if you like you can download by clicking here. Bottom line that you need to keep in mind is not to stow any incompatible cargoes together. Cargo density of the chemicals loaded on chemical tanker can vary drastically. Once you may be asked to load a cargo of density as low as 0.7 and then that which have density as high as 1.9. Chief officer must know what is the allowed cargo density for the vessel. You can find this information in vessel’s “Procedure and arrangement manual”. For example let us assume that the allowed maximum density is 1.025. If we need to load a cargo that has a density more than 1.025, we need to load the quantity that does not exceed the load density of the cargo tank. For example, let us say that a cargo tank has total volume of 3000 M3 and maximum allowed load density of 1.025. This tank can load a total of 3075 MT (3000 x 1.025) of cargo. Now if we need to load a cargo with density 1.5, we can only load 2050 m3 ( 3075 / 1.5) volume in that. The whole idea is not to exceed total weight of 3075 MT in this case. Bottom line, keep in mind the allowed load density of your tanks while planning stowage. Some cargoes have restriction of maximum adjacent temperature that you can have. For example we cannot load a polymerising cargo such as Styrene monomer adjacent to a heated cargo such as palm oil. These are the cargoes for which chapter 16.6 of IBC code applies. If in column o of the chapter 17 IBC code mentions 16.6, these restriction would apply to that cargo. Apart from polymerising cargoes, some cargoes can become off-spec if it is loaded adjacent to a high temperature cargo. IBC code does not take into account the quality of the cargo. So if any cargo has any restriction regarding adjacent temperature, the charterers need to advise in their voyage instructions. You can also find a fair idea from the Milbros/Miracle software. If Milbros software mentions these restrictions but your voyage instructions don’t, then you may need to clarify from the charterer regarding any of such limitations. Bottom line, do not stow a heat sensitive cargo adjacent to the heated cargo. While we have to check the stability of every ship we work on but there is something more with chemical tankers. For example I have worked on chemical tanker with 39 cargo tanks carrying 20 grades of cargo at a time. Some people work on chemical tankers with as many as 50 cargo tanks. This makes the satisfying of intact stability, strength, damage stability and drafts and trim requirements a challenge for chief officer. And there is no other way than checking each leg on the loadicator. This off course takes a lot of time. Charterers at times may want you to send the stowage plan in seconds. But you have a responsibility that a person sitting on other end may not be able to fathom. Bottom line is you should make it quick if the stowage plan is urgently required but not before checking each leg on the loadicator. Cargo stowage planning on chemical tanker is not like other vessels. There are number of factors that need to be checked to ensure that chemicals can be loaded, carried and discharged safely. 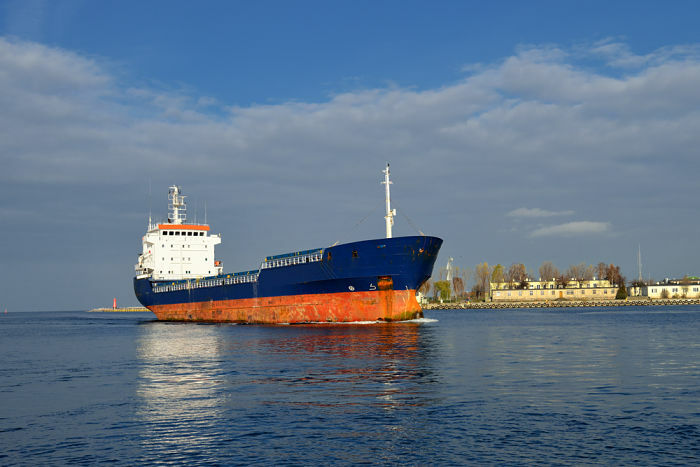 Specially as a first time mates on chemical tankers, you might find it difficult to know where you should begin with the planning of stowage, as it can all seem complex at first. Hopefully after reading this post, you can have a framework you can stick to while planning the stowage. Glad you found it useful Sagar..Let me know if you any question regarding chemical tanker operations if you switch to that side..
Of course sir, Thanks for helping us. i have been working on chemical tankers for about 8 years. i found it very useful and informative writing. Thanks for your sharing . Glad you found it useful Ercan.. Thank you Nicolas. Yes sure, I will write on venting systems soon.. I will write more posts on chemical tanker operations. Meanwhile if you have any doubt while on board, feel free to email me. hello Sir, could you share something on Framo pumps and its working ( tired of textbook language). Being a teetotaler with chemical tankers, i will be useful. Yes Sure Rahul, I will write on that shortly.. I have seen such a list from STOLT. But they have covered most of the trade names of the cargoes carried by their ships. With softwares like "Miracle" and "Milbros" these lists are no more required as all the information is their in these including all the trade names. Thanks Capt Ken for your kind words.. Thanks sir for your excellent and easy interpret note in order to prepare stowage plan on chemical tankers. Thank you sir, for such a simple and easy interpretation of stowage planning in chemical tanker. Thank you! Very helpful interpretation for the beginners. Much appreciate the effort you have put in to write a step by step guide for people who do not have as much experience as you do. Well done. Knowledge shared is knowledge enhanced. Thank you Rajeev. Hello Rajeev, very much appreciated your mentioning of Interline 9001 and International Paint's CRG website on your excellent website. I would appreciate if you can get in touch with me, as some of the information provided are incorrect, such as Interline 9001 does not have any restriction on FFA content, even though it is a notation 2. Great stuff you are sharing! Thank you.